If we asked enough people, we would doubtless discover a tendency to think that disagreement and conflict are incompatible with thriving. The simple reason for the prevalence of this thought is that it is at least somewhat true: a community cannot have ongoing, irate, throat-clenching fighting and thrive. But there is also another tendency that accounts for our aversion to conflict within the church. Put plainly, that tendency is to think that the church ought to be a place where conflict is not. The church, so this tendency tempts us to believe, is a place where holiness reigns, fights do not occur and everyone shares equally in the joy of Christian life. In some ways, this is understandable. 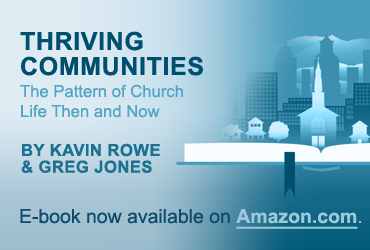 Christian discipleship, so Christians of every stripe have always thought, should and actually does make a difference for the life of a community or institution. Christians are supposed to grow in holiness, for example, and no amount of open-eyed and serious reckoning with the reality of sin should suggest otherwise. The problem, however, is that this aversion to conflict can all too easily overspiritualize the church and refuse to recognize its materiality, its “still-on-the-way-ness” that shows itself in everyday, real life. In ancient terms, such spiritualizing would find its home in Gnosticism. Contrary to the promises of the popular media, there are many, many more things that we do not know about the Gnostics than we do. But we do know that their tendencies were toward the denial of sin and consequent overemphasis on human freedom and the possibility for perfection. The Gnostics were “spiritual” people, those who thought that their knowledge of divine things would set them apart from the problems of the real, still-quite-sinful world. The New Testament itself does not share the view of the Gnostics. Indeed, the Acts of the Apostles -- often wrongly thought to smooth over church conflict -- shows a church with considerable conflict and disagreement. Often, the disagreement is compressed or seen most easily “between the lines,” such as in the case of Paul and Barnabas’ parting (15:36-41). But the overall picture remains clear: reading Acts would teach us that thriving does not exclude disagreement/conflict. Instead, according to Acts, to thrive is to be able to incorporate conflict and disagreement into the life of the community. The most famous example in which the author of Acts narrates the incorporation of conflict into the life of the community is the Jerusalem Council in Acts 15, considered by many historians to be the first great church council. The issue at stake in that council was whether Gentiles had to be circumcised to be saved (and by extension, therefore, whether they had to keep the Jewish law to put into effect the salvation given by Jesus). At this distance from the first century, it can be difficult for us to remember how important an issue this was to the early Christians. But it was nothing less than the first real tectonic theological issue in the emerging church, and it threatened its unity at the core (for confirmation of this fact, one need only read Paul’s vehemence in his letter to the Galatians, for example). There are three indispensable elements to the way in which the passage shows the processing of disagreement/conflict. Together they display a paradigmatic instance of the working of “traditioned innovation.” First, there is the experience of the Spirit (as recounted by Peter, then Paul and Barnabas). Second, there is the agreement of the Spirit’s work with Scripture (James’ citation of Amos). Third, there is a structure of ecclesial authority (James and the apostles have definitive weight in the final decision). Yet such elements are not given in a stepwise fashion, as if a community could always progress from the experience of the Spirit to the decision of the leaders. These three elements are instead indispensable parts of one complex and unified picture. Precisely because Acts tells the story of the Jerusalem Council by means of an interplay between them, we can see that all three are constitutive of the ability to incorporate deep conflict. The intertwining of the powerful work of the Holy Spirit, the prefiguring and confirming role of Scripture, and the discerning work of the community’s leaders suggests, further, that where communities sacrifice one of these elements for the sake of any of the others, they will not be able to incorporate well the conflict and disagreement that will inevitably come in their life together. Once again, the Acts of the Apostles would teach us to expand our notions of thriving. Reading Acts well requires us to include the ability to process and incorporate disagreement within the life of our churches as a mark of a thriving community. To thrive, according to Acts, is already to know that decisions of great theological weight and importance may well hang on our ability to acknowledge deep conflict and respond to its presence with discerning wisdom.